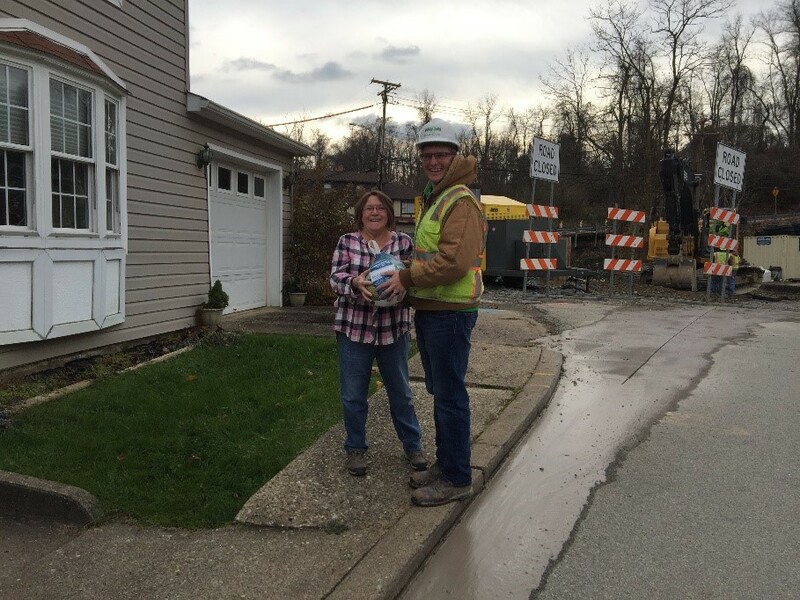 Walsh Construction, the lead builder on the Pennsylvania Department of Transportation’s (PennDOT) Rapid Bridge Replacement Project, recently provided Thanksgiving turkeys to several families across Pennsylvania who live close to bridge construction sites and have been affected by noise and commotion for the past several months. Despite what most would consider an inconvenience, the families embraced the initiative and progress to modernize the state’s transportation infrastructure. In fact, some appreciated the work so much there were occasional coffee and donuts that awaited the crew’s arrival on some mornings. Over the past week, Walsh employees have been hand-delivering turkeys to those good friends across the state. “We are excited to give back and thank our good neighbors who recognized and supported our crews while they worked hard to deliver projects safely and on-time,” said Mike Docherty, Project Director, Walsh Granite CJV. To see the bridges included in the statewide initiative and to learn more about the Rapid Bridge Replacement Project, visit www.parapidbridges.com. Additional information on the project and the team can be found at or by calling the project hotline at 877-444-9990 or email info@parapidbridges.com.